In the run up to the end of 2018, Cru Rasteau is delighted to join forces with La Mirande and especially with Séverine SAGNET, Chef of the “Table Haute” and her team, for 2 special Rasteau “Winegrower Evenings”! Make a note of the dates: Thursday 22 and Wednesday 28 November at 8pm. In the former kitchen of the Pamard family, on a venerable wood burning stove, surrounded by the instruments of great traditional cooking – copper pans, beautiful earthenware, old-fashioned kitchen scales and an enormous wooden table, Séverine SAGNET applies her motto, “from farm to table”, to prepare a set menu for up to fourteen guests sharing three sides of the enormous wooden table. This is the heart of La Mirande. In the convivial atmosphere which develops naturally, tongues loosen, and the ties created while sharing a meal can lead to lasting friendships. The wines of the appellation will be carefully selected to complement the culinary inspirations of the Chef Severine SAGNET. And this is the chance for us to tell you more about this energetic, passionate, and inspiring lady chef! 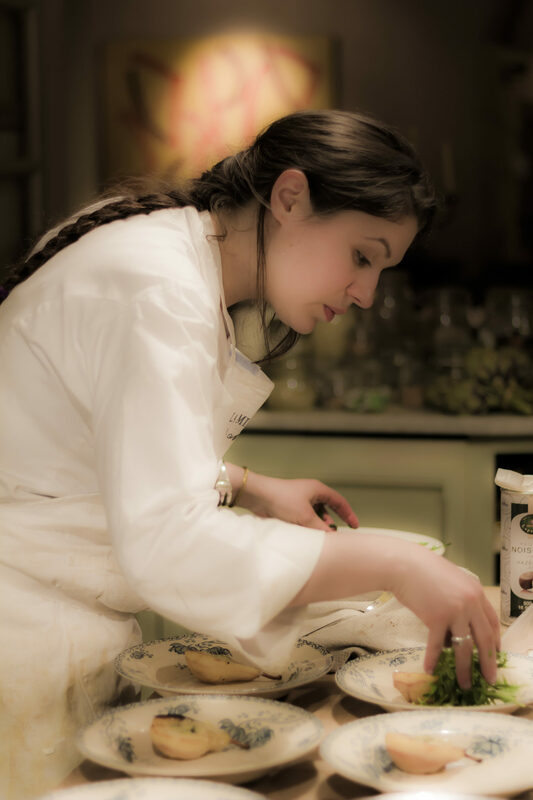 Séverine SAGNET followed a traditional cookery training background and then built up her experience working with reputed chefs such as Firmin Arambide, Michel Troisgros, and Christian Etienne. She then decided to go and work in England and Ireland to perfect her English. After that, her taste for management and the hospitality sector motivated her to pocket a degree in hotel management. It was this course that brought her to Avignon and she alternated her studies with work at Poppy Salinger’s Bastide Rose hotel. Thus began a long love affair between the Chef and the international clientele of this address in Provence. She has managed to combine management and cooking by directing the Cooking School of La Mirande. She has now been giving cooking lessons for 8 years while also preparing private meals at the “Table Haute’’ of La Mirande. 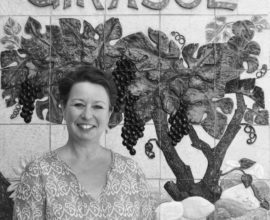 She has become an ambassador of Provencal gastronomy by combining local products and wines, visits to the market, and cookery lessons for local and international client. A.O.C RASTEAU: Of all your experiences, and especially your culinary experiences, is there one that stands out for you and, if so, why? Séverine SAGNET : “I love cooking with excellent products and I have special affinities with farmers who respect the earth. I like to feel the texture of the terroir on the plate, the product in all its simplicity, on a beautiful table, with a fire burning in the hearth, a good wine and good company”. A.O.C RASTEAU : You have been at helm of the “Table Haute’’ at La Mirande for some years now. How does it inspire you? How do you come up with your menus? And how would you describe your cooking ? Séverine S. : “For those that haven’t yet had the opportunity to test it? It is nature that creates the menu, so, for example, mushrooms and chestnuts in autumn. I go with the flow because at the beginning of each week the local producers bring me their best products. Then every morning I go to the market with the clients during the cookery lessons. I buy what looks most inviting at that specific point in time, and what my clients want to eat and cook with; it is cooking based on the inspiration of the moment…”. 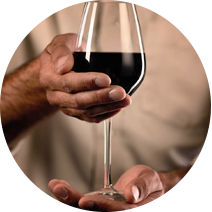 A.O.C RASTEAU : You are behind the organisation of the “Winegrower Evenings”. How did you get the idea of organising these get-togethers ? Séverine S. : “The original kitchen of La Mirande is just next to its medieval cellar. During the cookery lessons we very often propose wine tastings. So it was a natural step to invite the winegrowers, who share our values, to La Mirande to give our clients the chance to benefit from their knowledge and their presence”. 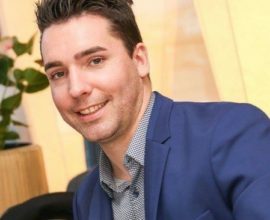 A.O.C RASTEAU : How do you choose the suppliers with whom you work? Séverine S. : “I like to work with suppliers who share the values that I hold dear, such as protecting the environment, promoting the terroir, and respecting ancestral working methods”. 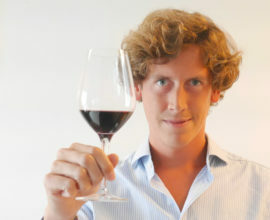 A.O.C RASTEAU : Could you describe your memory of the first wine that you tasted? Séverine S. : “The first wine I ever tasted was the wine made by my grandfather. It works marvellously well with my grandmother’s cooking. They form an inseparable duo, the wine adds bite to the meal, brings out the flavours, and creates a balance. You can’t have one without the other and their differences strike lots of melodic chords, it’s fascinating”. 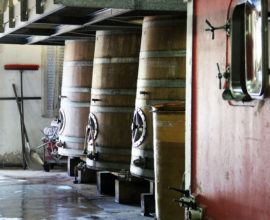 A.O.C RASTEAU : And how would you describe Rasteau wines in particular? A.O.C RASTEAU : What can we wish you for the year ahead ? Séverine S. : “Lots of meals, conviviality, smiles, and wonderful gastronomic discussions all over the world !”. From 8pm, on Tuesdays, Wednesdays, Fridays and Saturdays. The set menu costs €95 per person, including wine. Other days of the week: private events (private cooking lessons or private dinners at the Table Haute), booking necessary, tel. +33 (0)4 90 14 20 20 (minimum 10 people – €140 per person).